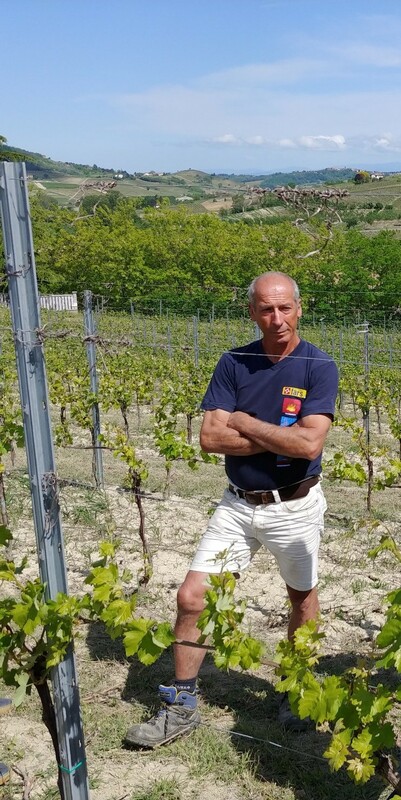 Adriano Giacobbe, determined vineyard manager, standing in Le Croci. This wine is produced exclusively from the Le Croci vineyard (“The Crosses”). The site is named for its location at the crossroads of two streets which together surround the areas of “Regione Croci” and “Frazione Croci”. The Sperone family is proud to call Le Croci Barbera d’Asti Superiore their finest red wine. This is a supple, expressive Barbera with structure suitable for aging. Le Croci is adjacent to Sperone’s Tenuta Neirano winery, perched on top of the Monferrato hills. The site’s southern facing slopes provide perfect exposure to sunlight, which then reflects against the white calcareous soil and back onto the vines. The vineyard is farmed without irrigation and has excellent drainage. In short, this a sweet spot to grow Barbera grapes. Production is limited to 2,400 lbs./acre through careful pruning in the winter and by picking fruit exclusively from older vines (around 30 years old). This keeps the juice very concentrated, with higher brix levels and color extraction than typical Barbera d’Asti. This diligent vineyard management also enhances minerality and color, without affecting Barbara’s playful, bright acidity and smooth tannins. When harvest time arrives, only the trusted hands of experienced farmers are allowed to pick the fruit. Le Croci is aged for one year in 250L French Oak barriques. New oak is not used because it interferes with Barbera’s varietal character and makes the wine unbalanced. The barrels are between 2 and 4 years old. Le Croci is produced by the Sperone family who have been making affordable premium wines for four generations. In 1911, Antonio Sperone opened a small wine shop in Torino where he sold bulk wine directly to consumers. Unsatisfied with the quality and price of the local wine, Antonio started his own winery in Puglia and built a bottling facility in Torino. He was soon able to offer his customers quality wines at prices everyone could afford. Sadly, it was destroyed when the city was bombed in WWII. The winery in Puglia survived the war and enabled Antonio’s grandson Giacomo to open a new facility in 1965 near Milan where he produced vermouth, sparkling wines, spirits and fine wines. In 1983, the family purchased 75 acres of prime vineyards in Piedmont and built the current winery in the small town of Mombaruzzo just outside Monferrato.